This post originally appeared on Cyborgology – read and comment on the post here. Presidential debates might be the single political event where Marshall McLuhan’s infamous phrase “the medium is the message” rings most true. Candidates know well that content takes the back seat, perhaps even stuffed in the trunk, during these hyper-performative news events. The video above of McLuhan on the Today show analyzing a Ford-Carter debate from 1976 is well worth a watch. The professor’s points still ring provocative this morning after the first Obama-Romney debate of 2012; a debate that treated the Twitter-prosumer as a television-consumer and thoroughly failed the social medium. Can we imagine a theorist of social media on the Today show this morning in 2012? Sigh. 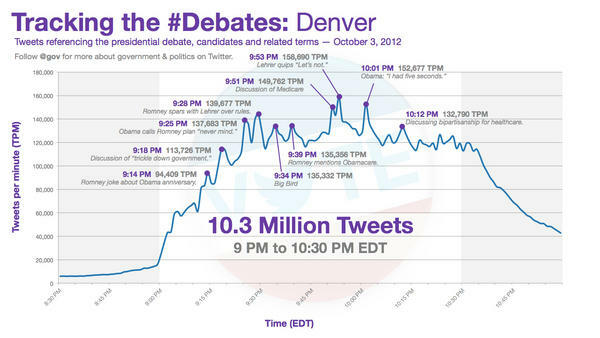 Moving on…social media lit up during the debate last night, primarily on Twitter. This was the most tweeted American political event and the campaigns continued to update Twitter during the event even when letting their Facebook and Google Plus pages go silent. Much of the discussion, from my anecdotal experience, was that the biggest loser was the very format of the debate itself. The sentiment was similar last night. While most agree that Obama lost to Romney, the biggest loser seemed to be the format, the lack of proper hosting from Lehrer, the banality of an event so focused on the television image. This was a television debate; neither candidate nor the host took social media as a medium seriously. “There were no zingers; no knockout blows; no major blunders”: Romney’s offense and Obama’s long-winded defense simply were not retweetable. There was a lack of sound-bytes, the content was astonishingly non-viral, the performance was even surprisingly non-GIF-able (Tumblr live-GIF’d the debate, but seemed to find little to work with). It is conspicuous, however, that the Big Bird moment is the only one that garnered such attention from the debate. Social media users expect to prosume the debates, that is, simultaneously produce and consume the experience, rather than the more consumer experience of television-only. The debate failed the social medium last night because it treated millions of prosumers as if they were consumers. Almost nothing about Wall Street or Main Street was as shareable as Sesame Street. Neither candidate seemed to have any awareness of virality. The twitterdrome was like dry kindling ready to come alight at the mere mention of, say, “the 47%” by Obama. The non-mention of the 47% proves the debate was misaligned with social media as a medium. Many will argue about whether social media either changes or simply amplifies mainstream media narratives, and I tend to think that it depends, from event to event, on the content. When the message succumbs to the social medium by becoming that which is most shareable, I believe that social media can indeed change the narrative. This was the case when Clint Eastwood “stole” the Republican National Convention when mainstream outlets were more likely to focus on Romney’s performance. Last night, Twitter users were very likely more concerned with Big Bird than their television-only counterparts. But Big Bird is minor and neither candidates did much of anything that was shareabe (positive or negative) and thus it is my opinion that social media was not used to set the overall media narrative. My guess is that, today, many will then claim that this is always true, that social media always amplifies mainstream media, but I do not think that is correct. It depended on candidates doing and saying things that are retweetable, reblogable, GIFable, “likeable” and so on. All this raises many questions: how might the debate format better account for social media? How might the format and the candidates perform their message subservient to the social medium, or, simply, how should candidates make their message most positively shareable? Or should they at all? Might presidential politics be better suited to television and not social media?